We discussed the fundamentals of Enterprise Java Beans earlier.Also we discussed Stateless Session Bean as well as Stateful Session Bean with examples. We did a comparison of Stateful Session Bean and Stateless Session Bean by using examples .Now it is the time to look into the details of Message Driven Beans. Like the previous examples, here also we are using EJB 3.x as EJB implementation. 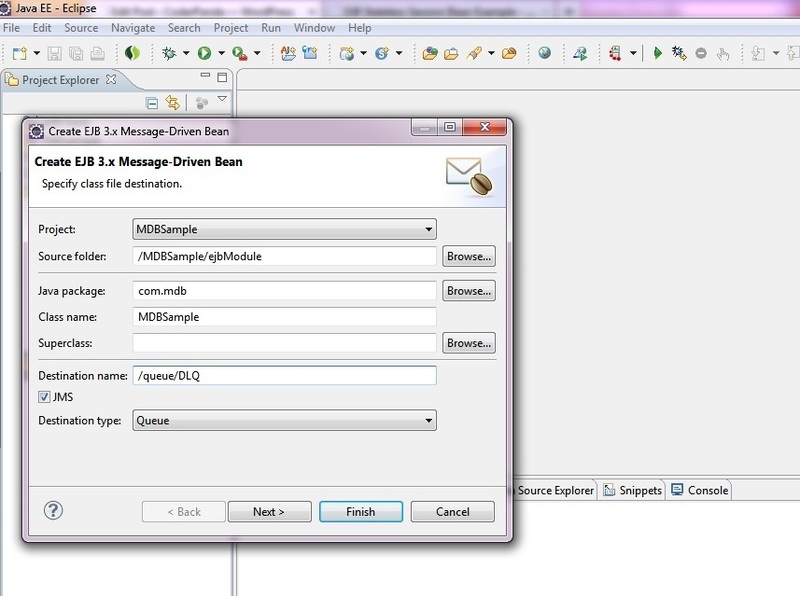 A Message Driven Bean is equivalent to an Asynchronous Message Receiver . We already discussed the basics of asynchronous and synchronous message consumptions in Java Message Service with examples . In case of of synchronous message consumption , the application execution stops at the receive() method. So synchronous message consumption is not an effective way to receive messages. In case of asynchronous message consumption , the consuming class needs to implement the MessageListener interface. There , if a message arrives the onMessage() method will be invoked.The Message Driven Bean is a server side component which receives messages asynchronously. In case of Session Beans, there were remote and home interfaces for the beans to access it from client side. In case of Message Driven Bean , there is no remote or home interfaces. Clients are not invoking Message Driven Bean instances by using JNDI.Instead clients can send JMS Messages to the corresponding queue or topic destinations. (Discussed in JMS Tutorial). Message Driven Beans will be invoked , when it detects a message in the destination to which it is listening. Like a Stateless Session Bean , a Message Driven Bean has only two stages in its life cycle. 1)Install Java EE if not installed already. Extract Eclipse and JBoss to suitable locations. Open eclipse in a suitable workspace. Select JBoss 6.x as target run time and EJB 3.0 as EJB Version.Give suitable name to the project.In this case we are giving as MDBSample. 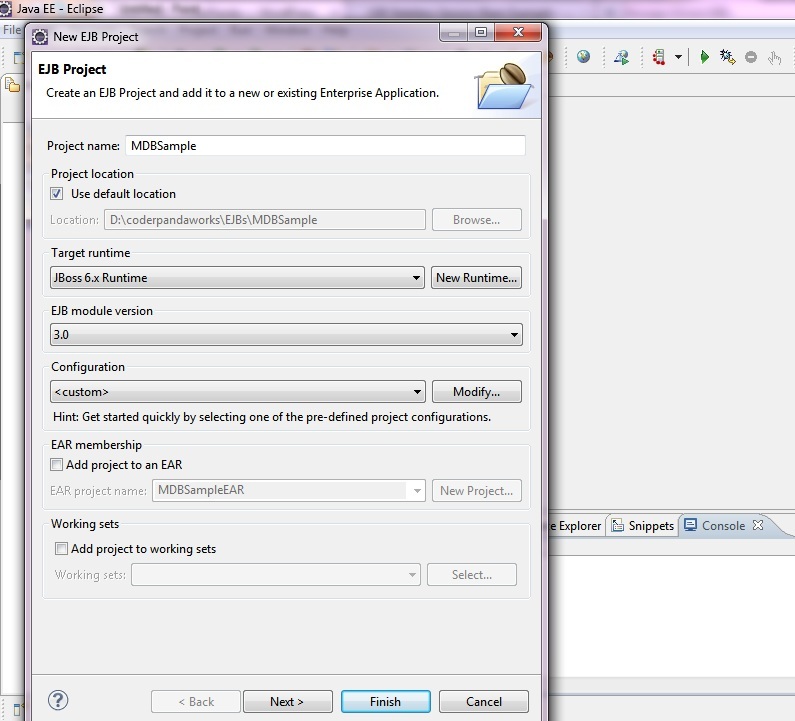 3)Now expand the project tree and create a new package in ejbModules.In this case , my package name is com.mdb. 4)Create a server instance by selecting the server tab near console.And add the newly created MDbSample project into it. 5)Now we need to create the Message Driven Bean. As we discussed earlier , a Message Driven Bean should be listening to a destination . In this example, we are deploying our bean to JBoss 6.0.0.M1. So first we should identify the destination options available in our JBoss version. The configured queue destinations will be listed there.We are taking the destination /queue/DLQ. Select destination type as Queue. Press Finish. The bean simply receives messages from the queue and displays in the console/log , if it is a text message. 8)Now we need to develop a client application. a)Get administered objects( connection factory and destination). We already decided our destination as /queue/DLQ. We can find the available connection factories at JBoss_Home\server\default\deploy\messaging\connection-factories-service.xml . We are using /ConnectionFactory as the connection factory. f) Create and send few text messages to the destination. Create a dynamic web application. Create the following class in it. 9)Start the server. Once the deployment of bean completes ,The following message will be displayed in the console. (If an exception 'org.jboss.deployers.spi.DeploymentException: Required config property ' throws while deploying the EJB , make the @MessageDriven annotation as of the MDBSample.java shown above.The restart the server.The MDBSample will be deployed now). 10)Now run the MessageSender.java. The output will be displayed in the console. It can be viewed in the log also.Once all the messages were sent by the MessageSender.java 'Messages were sent..' message will be displayed in the console.We can switch the console or check the log to view the received messages by the bean.